MetalGreymon X is an altered version of MetalGreymon that carries the X-Antibody Factor : MetalGreymon in its Digicore. MetalGreymon X is a Cyborg Digimon, an illegally-modified Digimon who survived the evil X-Program through the X-Antibody. After acquiring the X-Antibody, it triggered a Digivolution which mutated MetalGreymon's DigiCore, upgrading his armor and boosting his Battle Abilities. MetalGreymon X was added to Korean Digimon Masters on August 22nd, 2018. 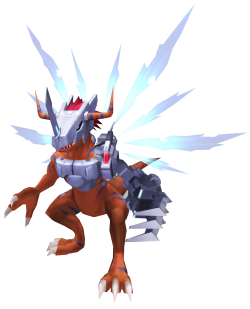 MetalGreymon X was added to Global Digimon Masters with the September 11, 2018 Patch. Trident Arm VER 9.9 Fire attribute 3 seconds cooldown 26 DS consumed 2 skill points per upgrade Learned at Lv. Strike opponent with its trident attached on its left arm. Giga Destroyer. Fire attribute 9 seconds cooldown 83 DS consumed 2 skill points per upgrade Learned at Lv. Opens up its chest and fires doubles missiles. This page was last modified on 21 April 2019, at 05:31.